While the driving guitars and deep lyrics of Tigers Jaw hook you in, the unique, emotive vocals of singer Brianna Collins keep you coming back for more. 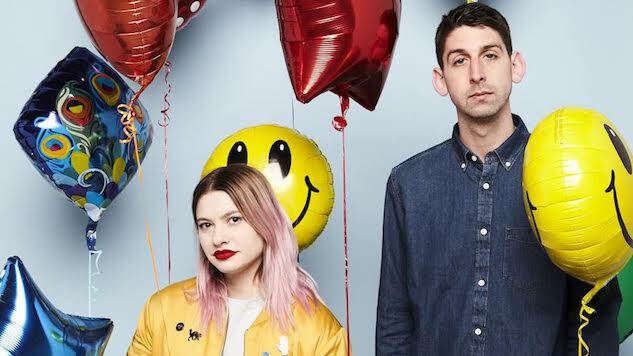 Since the 2013 departure of many of the original members, Collins and fellow Tigers Jaw member Ben Walsh have cracked the Billboard charts, toured the world and even found time to create another album. Their new album spin will be available on May 19 via Black Cement Records. The album release also kicks off Tigers Jaw’s new US tour, featuring Saint Seneca and Smidley. Paste chatted with Collins about her “scene” days, Twin Peaks and high school dress codes. Paste: When did you first start caring about style? Collins: I first became aware of the idea of having “style” during middle school. That was when it felt like it mattered what types of clothes you were wearing, and I started to care about how clothes could represent who I was. Paste: Did anyone in your family influence your taste in clothes? ? Collins: All of my family members seem to mold with whatever style is in within the times, and none of which is ever the same taste of clothing that I’m into. I have two older brothers and no sisters, and clothing is not something we bond over. I definitely look more to my friends (who are like my family) for inspiration and influence of my taste. Paste: Do you dress for yourself or for others? Collins: I definitely dress for myself the majority of the time. The most important thing for me is to always feel comfortable in what I’m wearing, both physically and mentally. If I’m too hot or too cold or am second guessing what I’m wearing all day, it stresses me out. Getting dressed in the morning always involves trying on multiple outfits to figure out what’s the best thing for me that day. Paste: How does the way you dress in day to day live differ from how you dress on stage? Collins: When I’m getting dressed and ready for day to day, I’m more inclined to just throw on a pair of jeans and a t-shirt because it’s easy and comfortable. For some reason, I hate wearing pants when we play. I don’t really even understand why—maybe I haven’t found the right pair of show pants—but it feels much more comfortable to wear skirts or dresses. I definitely am cognizant of the fact that I’ll be on stage and people will be looking at me. So on top of comfort, I want to make sure I feel confident in what I’m wearing. Paste: What is the relationship between music and fashion? Collins: I think the relationship between music and fashion can have a lot to do with presenting how you identify with a certain genre of music. I always think back to the early-mid 2000s and how it was so important to me to dress similarly to the people that were listening to the same music as I was. I don’t think it’s necessarily as straightforward today as it was back then. Today, there are a lot of overlaps between different styles and genres of music, but it definitely still exists. Paste: What’s the worst style trend that you ever embraced? Collins: Honestly, it’s hard to pick one—I’ve been into many “styles” that I laugh at when I look back on them. It’s unfair that the youth of today have access to the internet and can order clothes online. I think the last worst style trend I participated in was in the early-mid 2000s trying to look “scene,” which in my experience included having my hair dyed black with a “raccoon tail,” the big swooped bangs and heavy eyeliner, all while wearing studded belt with ill-fitting skinny jeans from the local mall and a youth large band t-shirt from Hot Topic. I grew up in a really small town and the only way you could shop then was to go to the mall, so I was working with what I had access to in order to achieve what I saw was cool on Myspace. Paste: What’s your go to summer outfit? Collins: In the summer, I love keeping it simple and throwing on a t-shirt dress and some vans. Paste: What movie, TV show, music video, etc. had the best style? Collins: I absolutely love Twin Peaks. The style/fashion in that show is so cool. So many dreamy sweaters. Paste: How did the kids dress in high school when you were growing up? Collins: Hollister was a big thing at our school, like if you were wearing Hollister it was “cool.” During this time, I was very into wearing band shirts that showed the type of music I was into, so I didn’t participate in that so much. In the last few years of high school, they had implemented a dress code where everyone had to wear polo shirts or a shirt with a collar which was super annoying. Paste: Do you think fashion is important on a larger cultural level? Collins: I think it’s important that fashion functions as a mode of visual expression, and that it serves as a way for people to can express their identity, culture or interests.